Recording in their Washington DC-based studio, Rob Garza and Eric Hilton, better known as the international, dynamic DJ and production duo, Thievery Corporation, have managed to blossom in the heart of a city they often refer to as “Babylon.” Although the city is best known as the seat of an aggressive American Empire, paradoxically, Washington DC has long been the home of a music subculture legendary for fierce independence, a staunch do-it-yourself work ethic, and conscientious social activism exemplified by genre-defining pioneers like godfather of go-go, Chuck Brown, and indie black punk rockers, Bad Brains. 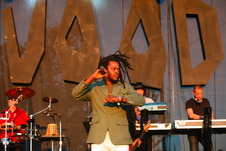 While other artists in the downtempo/remix genre were a flash in the pan, Thievery Corporation evolved with the times. Over the next decade, the duo’s music would be played on hit movies and television shows including Vanilla Sky, Garden State, The Sopranos, Six Feet Under, Alias, etc. 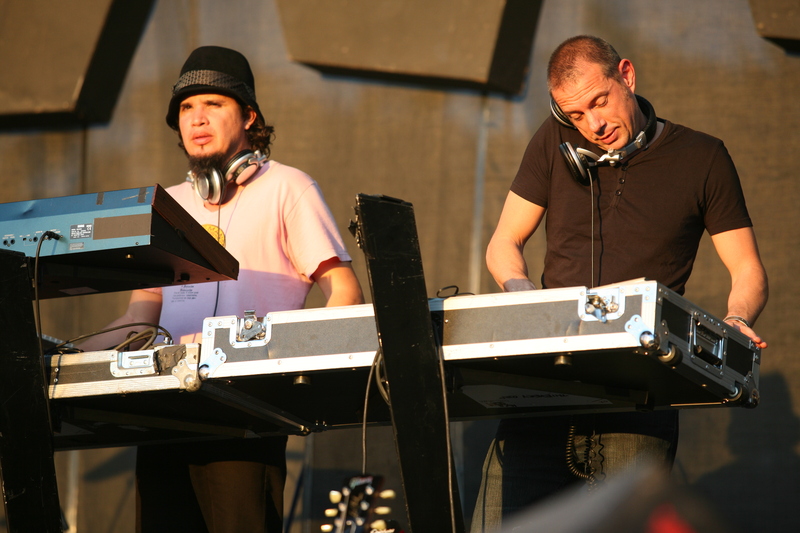 Thievery Corporation remixed the likes of David Byrne, The Doors, and Sarah McLachlan, and recorded four more critically acclaimed albums of original material, each one transcending the last in scope, style, and message: “The Mirror Conspiracy” (2000), “The Richest Man in Babylon” (2002), “The Cosmic Game” (2005) and “Radio Retaliation” (2008). “Radio Retaliation is definitely a more overt political statement,” says Rob Garza of Thievery Corporation. “There’s no excuse for not speaking out at this point, with the suspension of habeas corpus, outsourced torture, illegal wars of aggression, fuel, food, and economic crises. It’s hard to close your eyes and sleep while the world is burning around you. If you are an artist, this is the most essential time to speak up.” So, that’s exactly what they do with their newest album. Radio Retaliation finds inspiration in the uncompromising political music of groups like the Clash, Public Enemy, Fela Kuti, and is, without a doubt, Thievery Corporation’s broadest and most progressive album yet. The album imparts tough socio-political messages largely absent from today’s popular music. “Apart from a few independent bastions, there is no musical or informational freedom on the US airwaves anymore. They’ve been bought up, consolidated and homogenized. Music is suffering, and society is suffering too. Radio Retaliation is about an exodus of conscious people who are willing to acknowledge something is wrong with the ‘official version’ in news and culture,” explains Hilton. “This record is also our most internationally oriented,” adds Garza, describing how Radio Retaliation touches upon the eclectic sounds of Jamaica, Latin America, Africa, Asia, and the Middle East. “We worked with artists from around the world. The roots of our inspiration have always come from what is happening globally, and at the moment there is so much happening, on every level.” The world is clearly in agreement, as Radio Retaliation debuted as the #6 Record on ITunes, and remains in the top 10, and was simultaneously #1 in Greece for two straight weeks (beating out Metallica for the #1 spot), and also #7 in Croatia. With Radio Retaliation, Thievery Corporation raises the bar with a new cast of musical collaborators including Nigeria’s afro-beat heir Femi Kuti, Brazilian star vocalist and guitarist Seu Jorge, Indian sitar virtuoso Anushka Shankar, and Washington DC’s own go-go originator Chuck Brown. Also returning are long time microphone co-conspirators “The Fastest Reggae Rapper” Sleepy Wonder, rasta brothers Rootz and Zeebo (of See-I) and Notch. 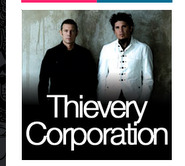 A defining element of Thievery Corporation’s sound has always been its decidedly organic quality. This is clearly evident in the rich productions of Radio Retaliation and recent live tour dates. Despite their minimal beginnings, Garza and Hilton have adopted a growing cast of collaborators over the years, vital musicians and vocalists who contribute to a dynamic 15-member live band. Playing sold-out venues and festivals worldwide, Thievery Corporation dazzles thousands of music fans every year with their kaleidoscopic live show. See-I will be performing in New York, on November 29th, at Webster Hall, during Ed Rosenthal’s Wonders of Cannabis party. Thievery Corporation’s Radio Retaliation world tour kicks off with three dates in a row at the 9:30 Club, in their hometown of Washington, DC, in January 2009.